Materials: Print with Nylon, ABS, PLA, CPE and PVA. 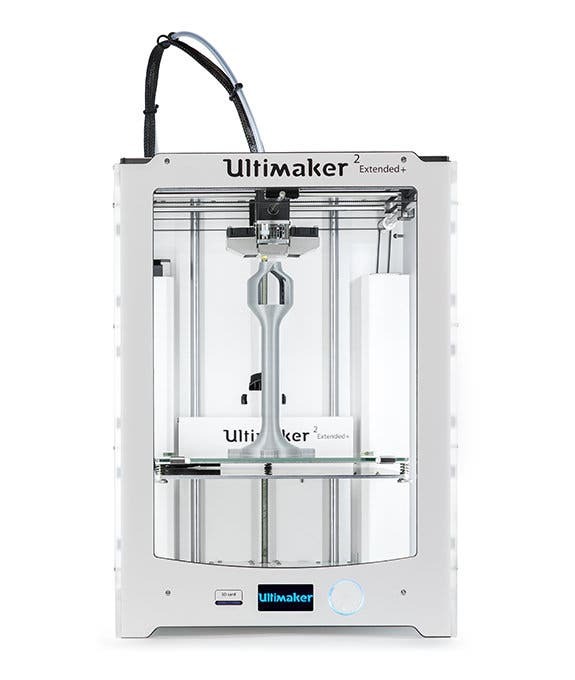 The Ultimaker 3 Extended is the larger version of the Ultimaker 3, launched in October 2016. It shares the same features and technologies as the 3, but boosts the build volume to 197 mm x 215 mm x 300 mm when using dual extrusion, or 215 mm x 215 mm x 300 mm when using single extrusion, so that you can create taller prints. 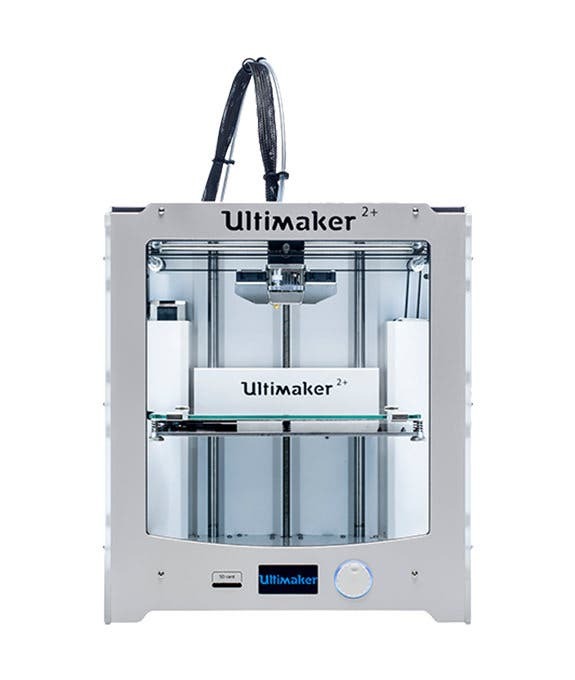 If you are looking for an industrial-grade 3D printer, look no further. 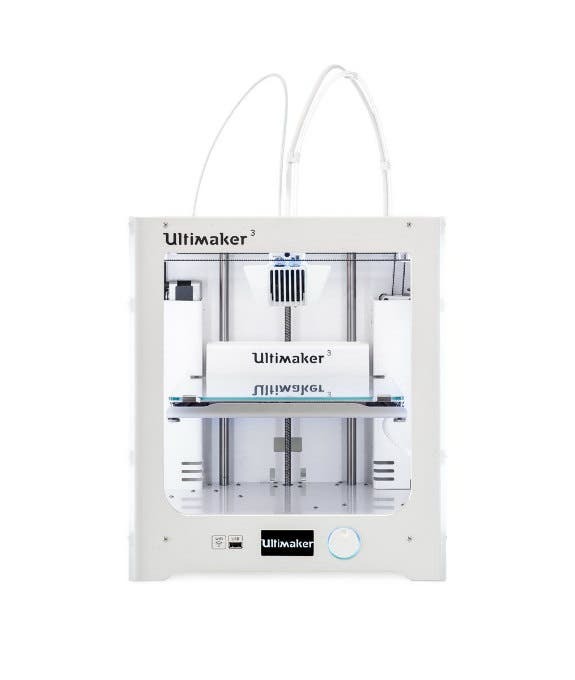 The Ultimaker 3 Extended is a huge upgrade over the Ultimaker 2+ Extended, with several new and powerful features that ensure a more accurate and consistent 3D printing experience. 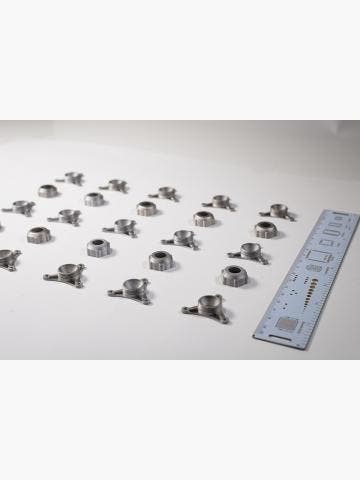 With the ability to print at a layer height of 20-microns, and a new extrusion system that can reach temperatures of up to 280 ˚C, you can 3D print super-detailed and super-complex models from Nylon, CPE, ABS and PLA, and 3D print water-soluble supports from PVA for all overhangs and weak spots, to significantly improve part quality. You can 3D print two materials at once (dual extrusion) and create sophisticated models, or you can print a single filament (single extrusion) for simpler models where a faster print speed is desired. 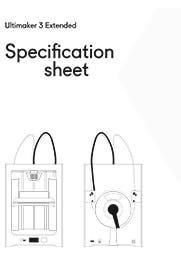 The Ultimaker 3 Extended gets automatic bed levelling, so you don’t have to manually adjust the z height for parts, and there’s even an NFC chip built into the spool holder which communicates with NFC-equipped Ultimaker Spools and automatically adjusts the printer settings to suit. 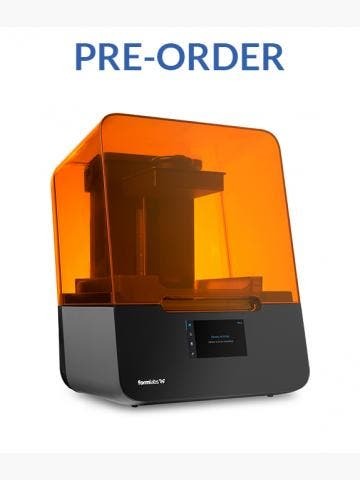 Add to that automatic Wi-Fi, USB connectivity and an Ethernet port, and you have one of the smartest 3D printers on the market. The 3 Extended also has an on-board camera, so that you can monitor the printing process remotely. 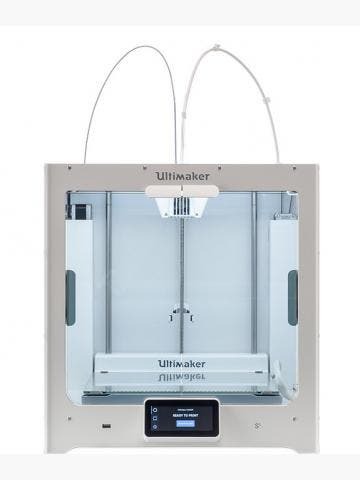 However, the stand-out feature of the Ultimaker 3 is undoubtedly the new swappable core system, which allows you to quickly and easily swap out filament cores to increase uptime by reducing the risk of clogging for a more reliable 3D printing experience.